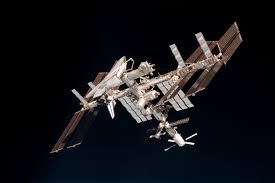 We completed our booklets and Ash class really enjoyed sharing their Life on the International Space Station booklets with Apple class. 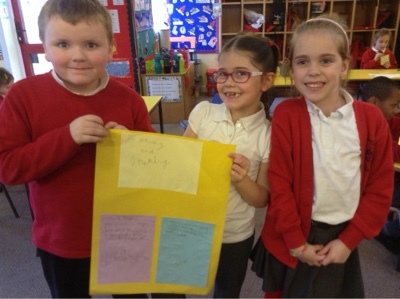 They could read out all the information they had written, talk about their drawings and Apple class were great listeners too and asked excellent questions. We look forward to doing this again soon. 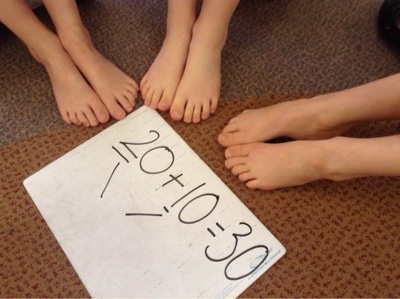 This week in Maths we will be focus img on subtraction. How many words for taking away do you know? We played some taking away games to get our brains going. This half term's learning - Fabulous Flight! Finding out about life on the International Space Station and making information leaflets. · Reading 'The Sulky Vulture'. 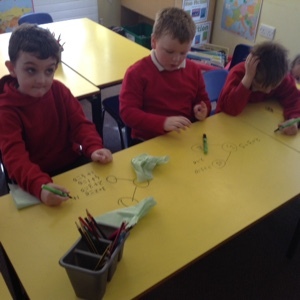 · Learning how to write a compound sentence. 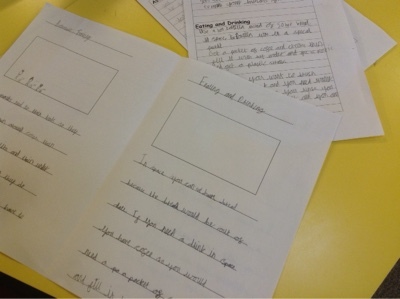 · Finding out about the features of non-fiction books. · Thinking about where books take us as part of Book Week. 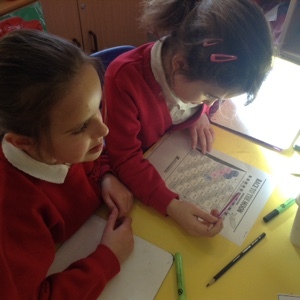 · Focusing on correct and varied punctuation in a sentence. 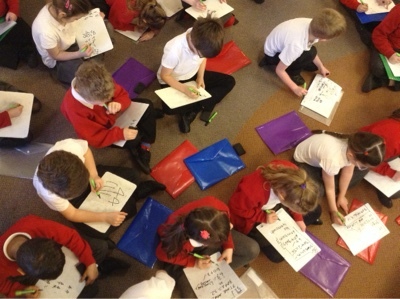 · Continuing weekly guided reading sessions. 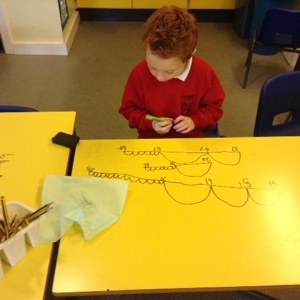 · Continuing daily phonics practice. 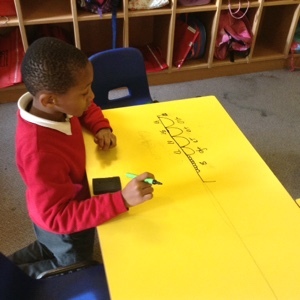 Using number lines to support our addition and subtraction. Reinforcing our earlier work on halves and quarters. Conducting our own investigations and making predictions. 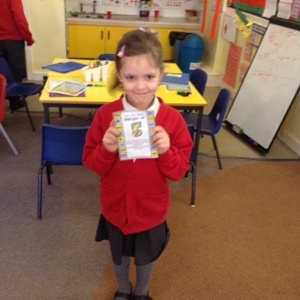 Cooking - what can you do with an egg?! Finding out about the history of flight. 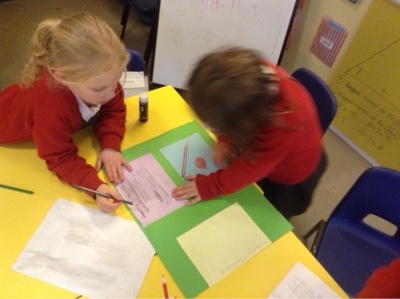 Finding out about different countries through our work on birds. Continuing to use the large apparatus. Developing our teamwork skills in outdoor games. Thinking about signs of new life in the Springtime. Thinking about eggs as a symbol of Easter. 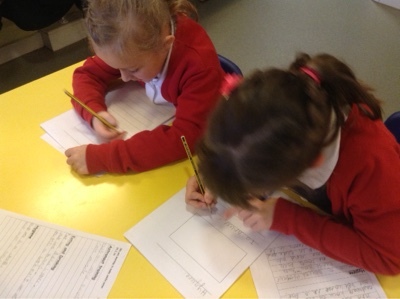 · Writing to our link school in Nepal. 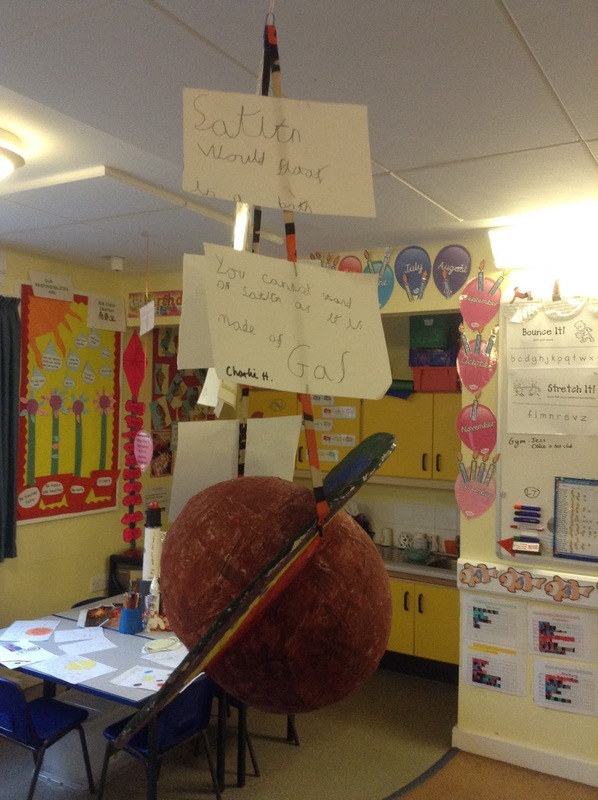 We have been focussing on recording information about certain aspects of life on the International Space Station. Taking notes was the first job, using the information from all of the videos we have been watching. 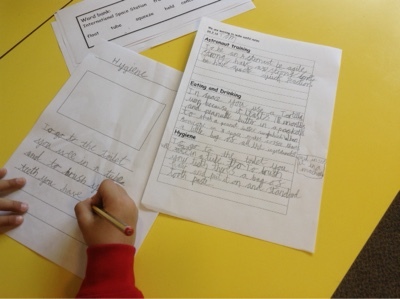 We then used these notes to write interesting sentences about three subject areas; Astronaut Training, Eating and Drinking and Personal Hygiene. 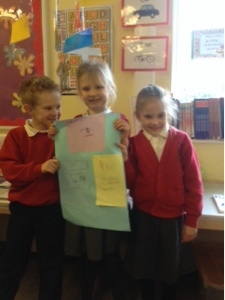 Some of us worked in groups to produce information posters which look great! Just the front covers to complete, and our booklets will be ready to share ~ hooray! Can you tell someone at home what this was all about? 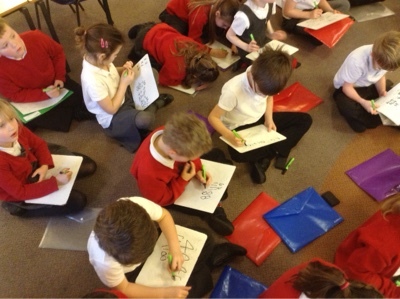 We had to think quickly and record with speed during Mrs T's PowerPoint Challenge this morning. 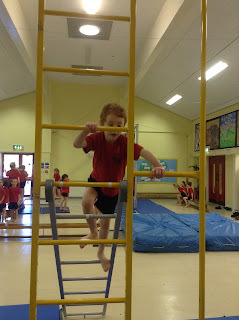 Once we got the hang of what to do, there were lots of ticks and loads of smiley faces! 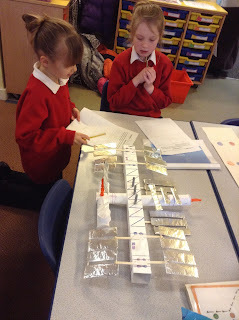 We're all going on a . . . multiples hunt! 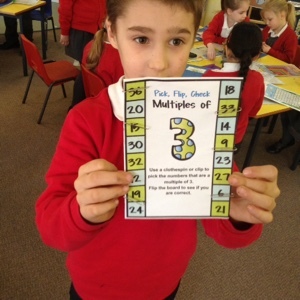 We have been exploring multiples of numbers by making our own multiples book to explore the 5, 10, 2 and even the 3 and 4 times tables and where they might be hiding in our hundred squares. It has been really fun! 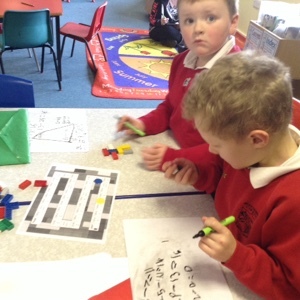 We have then been looking at the patterns we have made to give us clues as to what multiples a number could have. 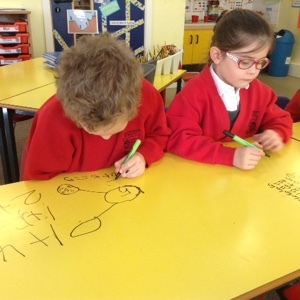 If it ends in a 0 it has to be a multiple of 10 . . .
We then put lots of numbers around the classroom to see how we could use our books to help us with our multiples hunt. 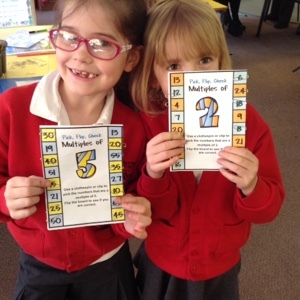 Can anyone remember what a prime number is? 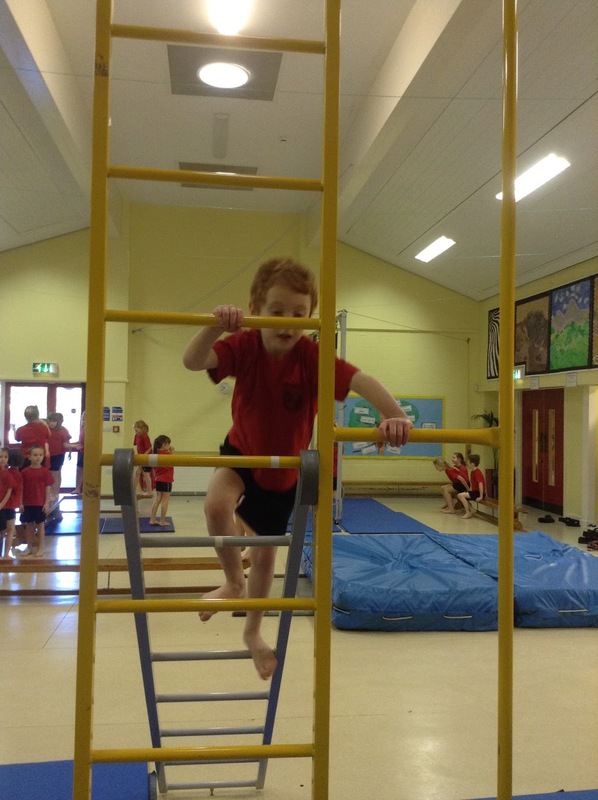 Ash class continued their astronaut training by increasing their core strength and balance on all the different apparatus we had out in our PE lesson. We all really enjoyed pretending we were doing a moon walk, jumping off into space and finding our way through the different parts of the ISS! 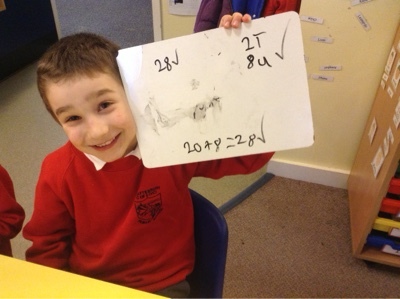 Mrs Tatman had fun exploring adding multiples of ten this morning. Unfortunately, her shoes were a bit tricky to take off, so her groups had to help her out! 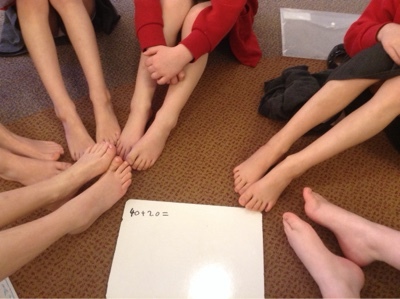 Mrs T wrote an addition number sentence and they had to work together to use their feet to find the answer. Lots of focus on how many tens! 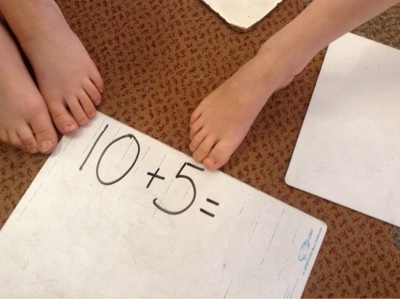 We discovered that we could add fives too! Luckily, all socks, tights and shoes were back on for playtime! 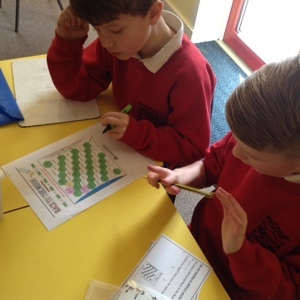 Cactus plants are very qualified to show us about adding ones, tens and hundreds! 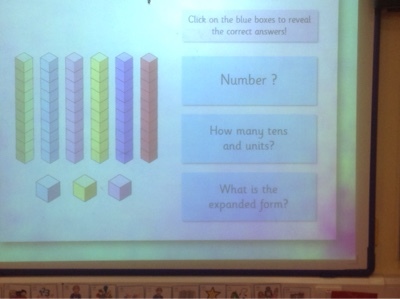 We have been thinking about place value in our addition work today. 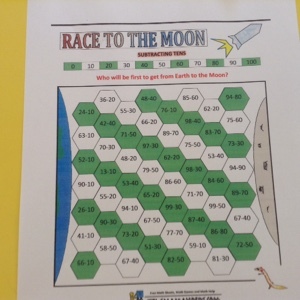 This song is great for reminding us about hundreds, tens and units! Mrs Turner and Alfie were watching some more space videos at home and they were too cool not to share! Lots of you were asking how to go to sleep in space - here is the answer! This one is really awesome. Look what happens when you try to wring out a wet cloth in space! 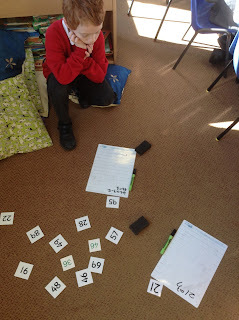 We were playing a game to find multiples of 2, 3, 5 and 10 today. 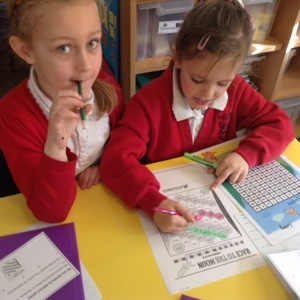 Can you remember the multiple rules? 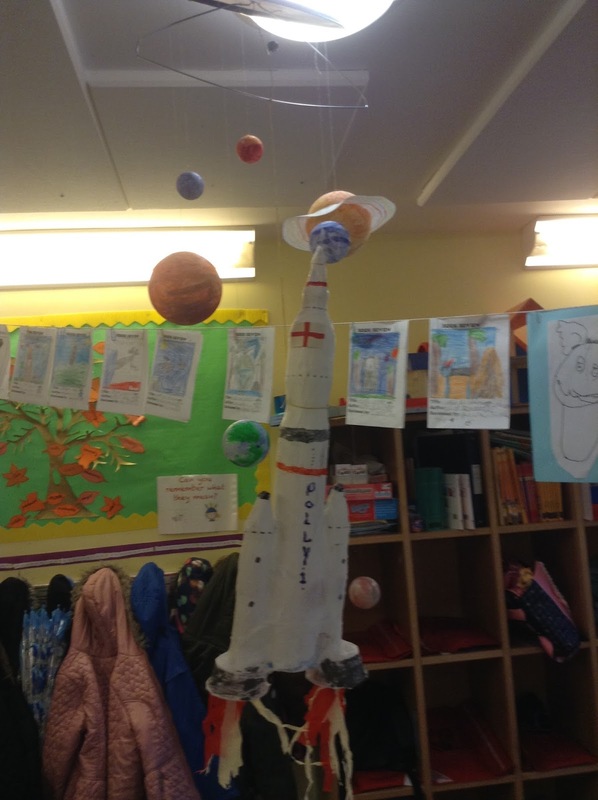 We had a great morning looking at all the brilliant homework that had been made over the past few weeks to launch our Tim Peake week. 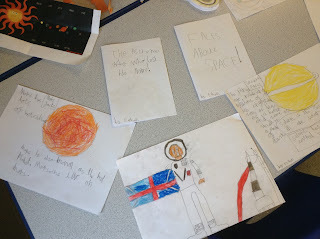 There was some fantastic work that really helped us all to learn more about space, the International Space Station and the solar system. 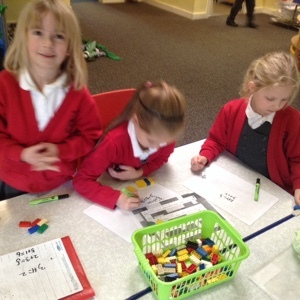 Mrs Turner's maths group before play were looking at finding the difference between numbers. 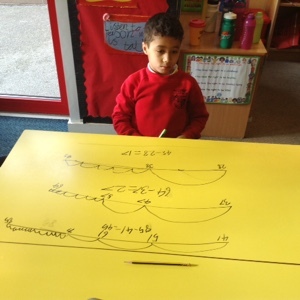 A big number line on the table really helped us with this - we could easily jump in tens and ones to fill in the gaps. 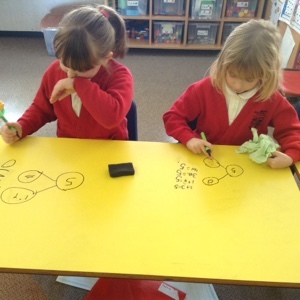 Mrs Turner's group after play used the tables to help us with those tricky number bonds of small numbers. We are getting a bit speedier with these now! 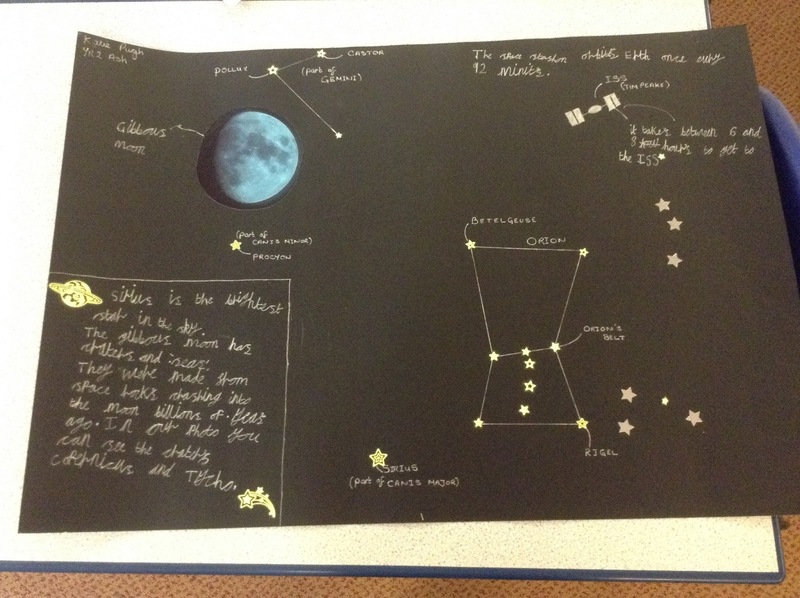 Amazing homework Walnut part 3! 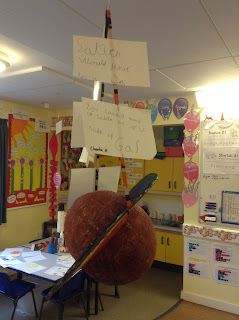 Amazing homework Walnut part 2! Why do astronauts need Maths? The answer is 40........ what is the question? Why do we need multiplication? Walnut Help Mrs Goodwin's Class....... again! Row Your Boat? Or even better?! Times Tables True or False? Walk? We know a better word than that!